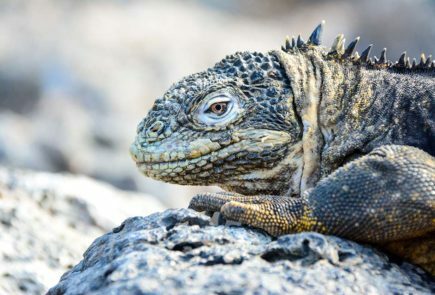 Get the best of both worlds by exploring an active volcano in the Galapagos Islands together with day trips to rewarding visitor sites in the National Park & Marine Reserve. The Finch Bay Galapagos Hotel (Santa Cruz Island) joins forces with Scalesia Lodge (Isabela Island) and develops a stunning week-long program in the Galapagos including inter-island flights, day trips on board the Sea Lion Yacht, “glamping” in luxury tents up in the highlands of Isabela Island, and visits to remote places that no other “island hopping” trip will ever experience. Get ready for one of the most highly anticipated voyages in the Galapagos. Fly from Ecuador’s mainland to the Galapagos Islands (Baltra Island) and take a very scenic inter-island flight to Isabela Island. INTER ISLAND FLIGHTS limit passengers’ check-in luggage to 10 kg (22 lb). If needed, it is possible to send excess luggage directly to the Finch Bay Galapagos Hotel, where you will arrive on DAY 4. 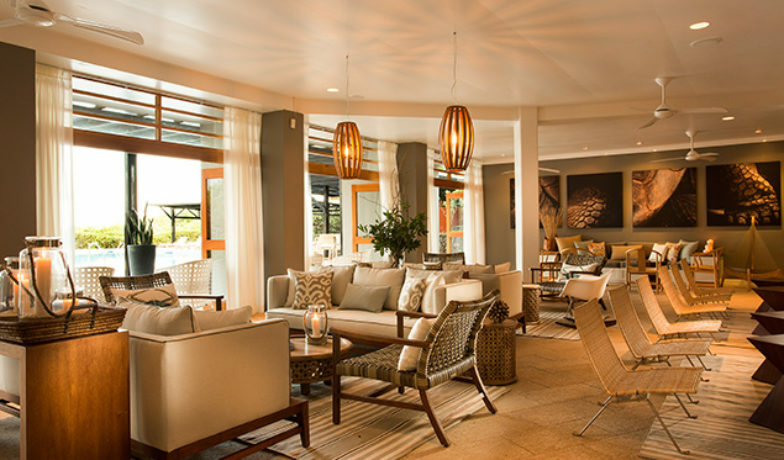 Check in at Scalesia Lodge and eat lunch before heading out on your first afternoon of discovery. Get to know the youngest side of the archipelago while exploring the rewarding visitor sites of the National Park, wetland lagoons, and the giant tortoise-breeding centre. Wrap up your day at the stunning white beach of Puerto Villamil before returning to the Lodge for dinner. Day 2 and 3: Each includes one of the following programs. Sierra Negra volcano and beach-combing. Wall Of Tears and beach-combing. Sierra Negra Volcano. Walk along the rim of Galapagos’ largest caldera – one of the largest in the world – and see recent volcanic activity (last eruption in 2005) and the resulting fascinating formations. A light snack will be provided along the way while lunch is served back at the lodge. Wildlife focuses on the Darwin finches, flycatchers, mockingbirds, and occasionally the Galapagos hawk and rail. Stroll the beach at Puerto Villamil or rest in the afternoon. Tintoreras Islets. After breakfast, we will drive down to the wharf of Puerto Villamil and board the bay cruiser to explore the maze of reefs and islets off the shores of Isabela. 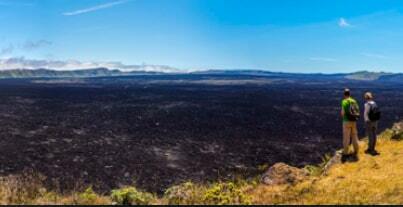 The visit includes a dry landing and a short walk over volcanic terrain (730 m/0.5 mi total distance). Relevant wildlife includes boobies, herons, penguins, marine iguanas and the white tipped reef sharks in the nearby lava crevasses. Bring your bathing suit as you will enjoy snorkeling in the shallow reefs. Lunch at Scalesia and later in the day, we can explore the wetlands of coastal Isabela. Sunsets at Puerto Villamil are spectacular! Wall of Tears. A rare combination of human and natural history. A splendid coastal trail combines two segments: 1st part, mangroves and brackish lagoons (1.3 km/0.8 mi) and the arid palo santo forest until we reach the Wall of Tears (an additional 2.2 km/1.4 mi each way). This trail is mostly a flat dirt road (pedestrian and bikes only). Wildlife include coastal Darwin finches, doves, stilts, ducks, flamingos, herons and giant tortoises. Afternoons include the magical sunsets from the beach of Puerto Villamil. Dinner and overnight at Scalesia Lodge. After breakfast, Scalesia Lodge’s staff will bring us back to Puerto Villamil’s airport. A short but interesting flight will bring us back to Baltra. Your guide will lead you across the Itabaca Channel to Santa Cruz Island. The day’s visit includes a brief exploration of Los Gemelos, a natural volcanic formation in the upper end of the windward side of the island. Surrounded by a forest of high growing endemic daisies, this area is home to some of the most elusive land birds of Galapagos. Then we will visit the Tortoise Reserve, impressive lava tunnels and enjoy lunch at a restaurant in the highlands. 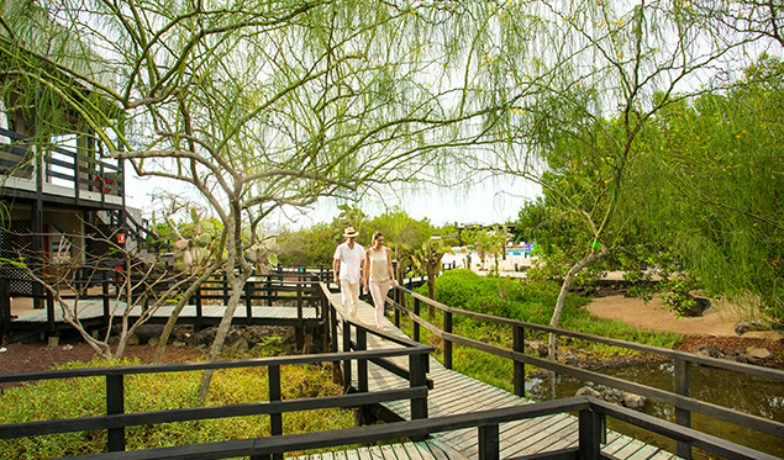 In the afternoon, you will reach Puerto Ayora’s only pedestrian neighbourhood, Punta Estrada, where the Finch Bay Galapagos Hotel is located. 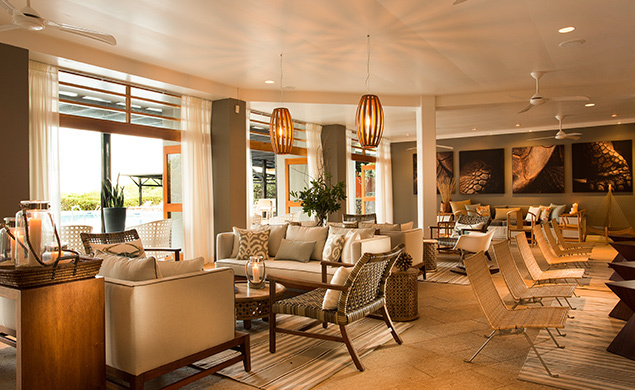 Check-in and enjoy the hotel’s beachfront facilities. Dinner is up to you: choose the hotel´s signature cuisine or one of the many options in town. Overnight at the Finch Bay. Day 5, 6 and 7: Enjoy 2 of these 4 full-day yacht explorations. 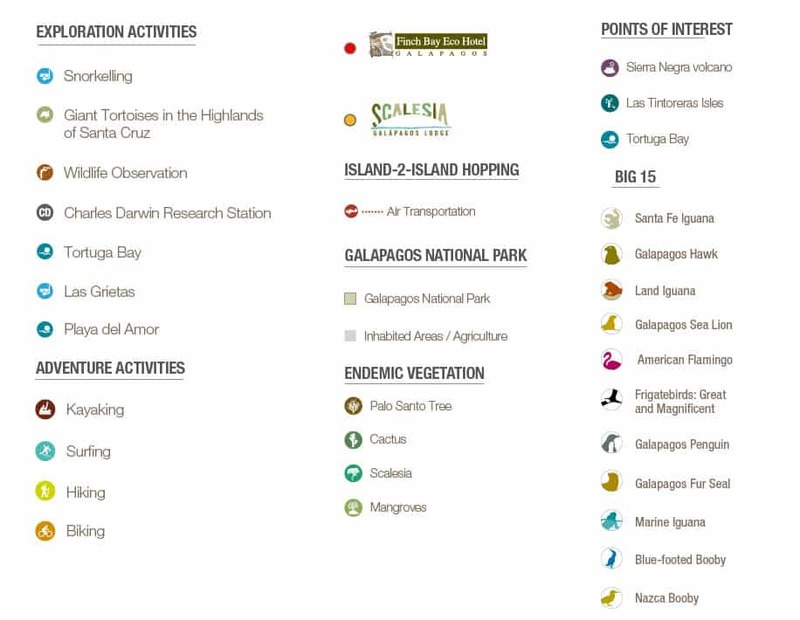 Depending on the weekday and availability, you can choose any of these explorations. Charles Darwin Research Station and Tortoise Breeding Facilities. North Seymour. 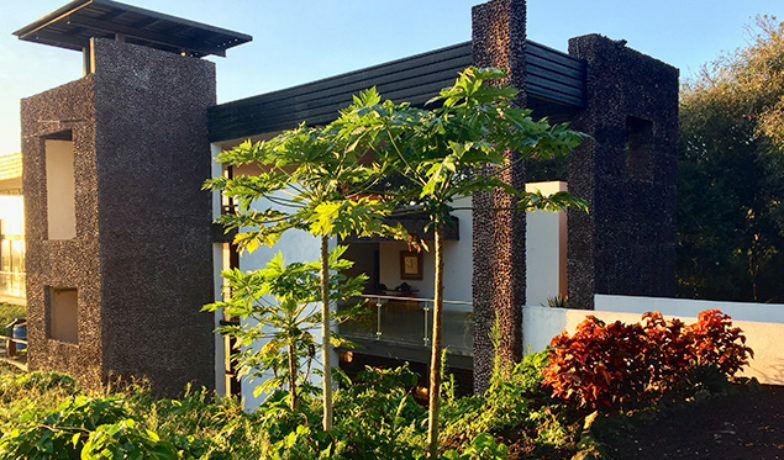 Start the day with the Finch Bay’s generous breakfast, featuring local and international favorites, before leaving for Itabaca Channel, 42 km away on the north shore of Santa Cruz. Board the Sea Lion yacht. Your day includes a dry landing and a 1.5 km/1 mi walk over a mixture of sand and rounded boulders. Be amazed by land and marine iguanas, Nazca- and blue-footed boobies, frigates, sea lions and fur seals. The other highlight is Las Bachas, a stunning white beach with dreamy small brackish lagoons, home to various waders, such as plovers, stilts and flamingos. You have a chance to swim or snorkel here. Santa Fe. After breakfast, we will board the Sea Lion yacht minutes away from the hotel at Academy Bay. The yacht will cruise to Santa Fe, an impressive volcanic island 17 nautical miles away from Puerto Ayora. 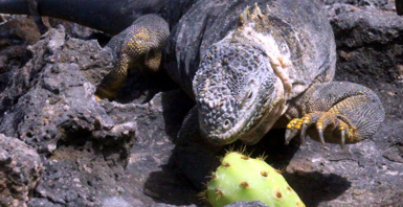 After a wet landing on a fantastic white sandy beach amongst basking sea lions, we walk along a rocky terrain to find the island’s highlight: the endemic Santa Fe land iguana patiently waiting under the enormous giant cacti for falling fruits and pads. Other relevant species today are pelicans, boobies and the archipelago´s top predator, the Galapagos hawk. 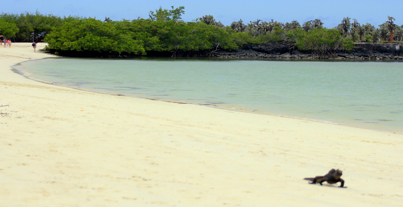 Return to the yacht and enjoy one of Galapagos best snorkeling sites. Lunch on board the Sea Lion yacht. Upon the cruise back to Puerto Ayora, we scan the sea surface for pelagic birds and whales. Bartolome. 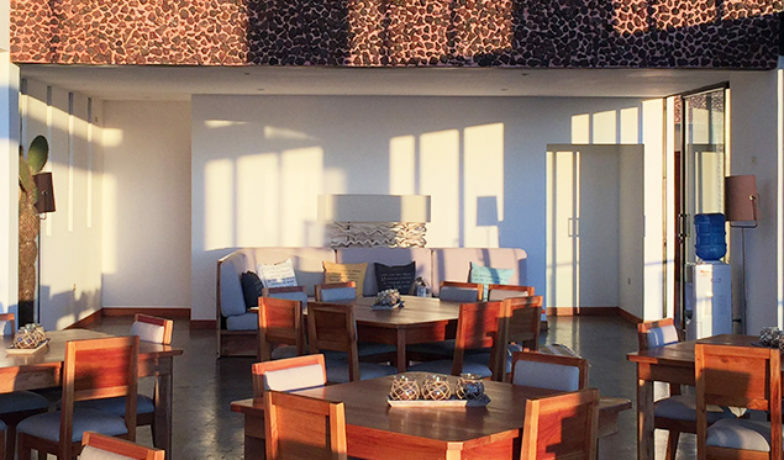 Start the day with the Finch Bay’s generous breakfast, featuring local and international favourites, before leaving for Itabaca Channel, 42 km away on the north shore of Santa Cruz. Board the Sea Lion yacht. A 21-nautical mile sailing stretch is well worth its length. Dolphins or whales are often seen in these waters. A dry landing marks the start of the 1.5 km/1 mi walk. Much of the trail is over a wooden boardwalk with a staircase of 366 steps. There are several observation platforms on the way up to the summit of Bartolome (150 m above sea level). Once atop, you will enjoy one of Galapagos’ most famous views: the tilted pinnacle rock, the golden beach of Bartolome and the impressive lava fields of Santiago Island. 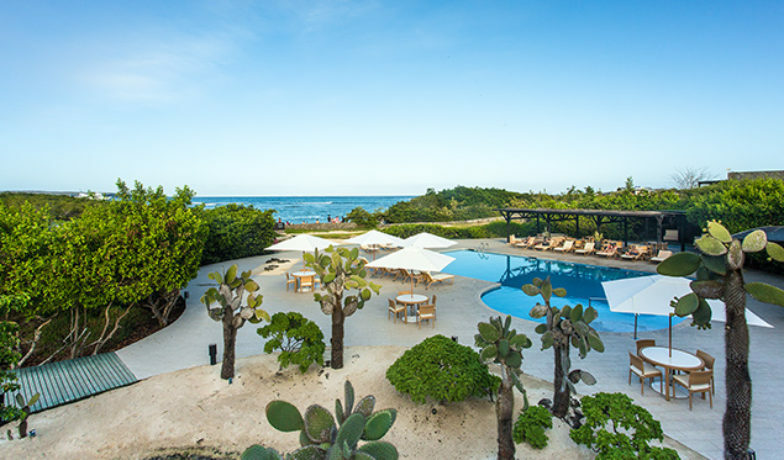 Upon descending back to the coast, you will have a chance to scan the volcanic shore, in search of flashy Sally Lightfoot crabs and Galapagos penguins, before enjoying a soothing dip at the beach. Lunch on board and a brief exploration of nearby Sullivan Bay before sailing back to the Itabaca Channel for the drive back to the hotel. South Plaza. After breakfast, you will board the Sea Lion yacht (depending on the day, it could be moored in Itabaca Channel or in Academy Bay). Your day includes 2 highlights. One of them, the snorkeling/swimming site known as Punta Carrion, has a name that startles some English speakers, but in this case, it’s merely a reference to a family name. And just 8 nautical miles away, South Plaza Island shocks visitors with the sheer volume of amazing wildlife that greets them right upon arrival: dozens of frolicking sea lion pups, patrolling alpha male sea lions, basking marine and land iguanas, stunning red crabs and various Darwin finches await. The trail is over 1.5 km/1 mi long, over rounded boulders. After breakfast, we leave for Tortuga Bay, voted Ecuador’s best beach. We walk from Puerto Ayora’s western border, 2 km/1.3 mi along a fairly flat and straight paved path, where we explore and understand more about the arid zone´s deciduous forest and its inhabitants. First, we arrive to Playa Brava, a stunning 1 km long snow-white beach, a seasonal nesting site for the green sea turtles. A few minutes further, we reach Playa Mansa, a secluded natural mangrove cove, with clear and tranquil waters, ideal for swimming, snorkeling, paddling on tandem kayaks, or simply enjoying the landscape from the shade of a mangrove. We will board a small yacht to sail back to the hotel’s dock at Academy Bay. Lunch at the Finch Bay. For the afternoon, the grand finale includes strolling around the Charles Darwin Research Station where the highlight is the conservation program for the iconic giant tortoises. 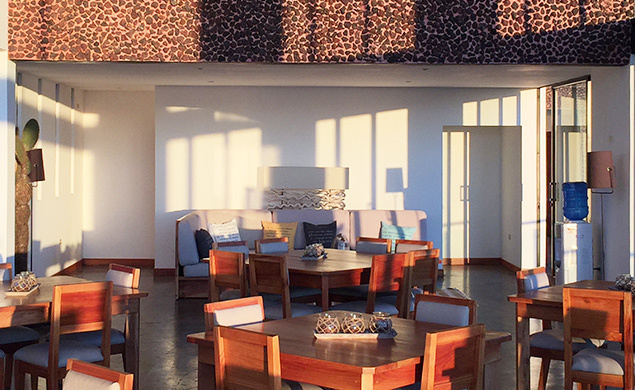 All days you return to the Finch Bay Galapagos Hotel, and enjoy the sunset from its beachfront facilities. Dinner is up to you: choose the hotel´s signature cuisine or one of the many options in town. Overnight at the Finch Bay. Breakfast at the hotel. Transfer to Baltra Island and airport by hotel staff. Itineraries are subject to change without notice. 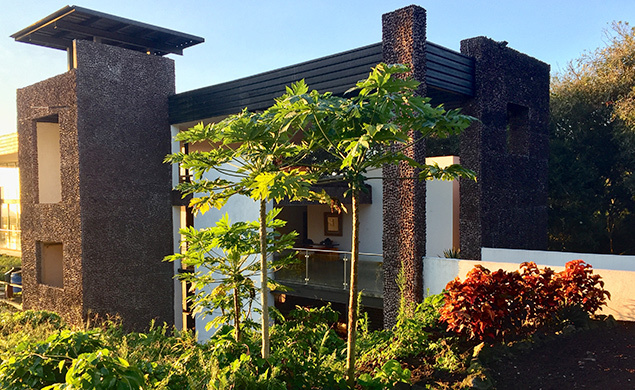 The sequence of visits might be altered depending on arrival of flights to Baltra or Isabela Islands, yacht availability, National Park requirements, weather conditions, or other unexpected circumstances beyond our control. – NTER-ISLAND FLIGHTS: 9 kg (20 lb) for checked bags (airline allows an additional 5 lb/pax at US$ 2.00 per pound) and 2.3 kg (5 lb) allowance for carry-on /pax. Upon arrival in Baltra, Scalesia Lodge staff will collect the luggage for transfer to the Finch Bay Galapagos Hotel. On DAY 4, upon check-in, you will find this luggage in your room.